Helen Shiller is an activist and a Democratic Party Alderman in Chicago. Helen Shiller and Cinta Johnson of the Intercommunal Survival Committee were delegates at the conference. In June 1980, Helen Shiller stood as a candidate for the position of at-large Delegate to the Board at the Annual Convention of the Independent Voters of Illinois-Independent Precinct Organization. 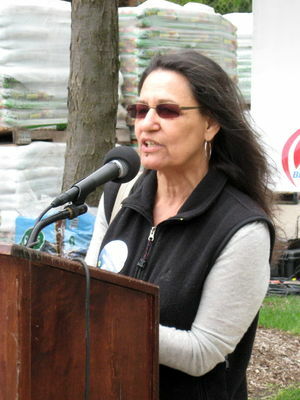 In 1981 Helen Shiller was on the Board of Directors of Independent Voters of Illinois-Independent Precinct Organization. On November 10, 1991 Helen Shiller was listed as a member of the 1991 Tribute Committee for the Chicago Committee to Defend the Bill of Rights Bicentennial Celebration. A Progressive Chicago report to Keith Kelleher, dated October 27, 1993 listed several more contacts and potential members of the organization. It stated that Alderman Joe Moore had agreed to participate and that State senator Alice Palmer was interested and was awaiting a call from Peter McClennon. Peter McLennon - Chui Garcia, Miguel Del Valle, Alice Palmer and Buzz Palmer, The Altged Group participants and John Steele. Dan Swinney - Carole Travis, UAW, Frank Lumpkin, Wisconsin Steel, Rev. Jim Reed, Methodist Church, Eddie Burke of the Teamsters. Others targeted for contact, but not assigned, included Clem Balanoff, Sue Purrington of NOW, Jane Ramsey at JCUA, Erlean Collins, Westside Black elected officials and PUSH, TWO and Joe Gardner's Project Hope. Helen Shiller also had ties to Communist Party USA splinter group Committees of Correspondence. "Over 500 delegates and observers (including 140 from Chicago) attended the founding convention of the Committees of Correspondence (CoC) held here in Chicago in July. New Ground reported that speakers…included Charles Nqukula, General Secretary of the South African Communist Party, Dulce Maria Pereira, a senatorial candidate of the Workers Party of Brazil, Angela Davis of CoC, Andre Brie of the Party of Democratic Socialism of Germany (a revamp of the old East German Communist Party). Guests during the Convention included Cook County Commissioner Danny Davis, Chicago Aldermen Helen Shiller and Rick Munoz, a representative of the Green Left Weekly of Australia and a representative of the Cuban Interest Section." In 1994 Helen Shiller, Chicago was listed on a "Membership, Subscription and Mailing List" for the Chicago Committees of Correspondence, an offshoot of the Communist Party USA. 200 people attended a panel presentation on "The Progressive Potential of Chicago City Politics" December 8 1998 at the University of Chicago. The panelistsincluded Jackie Grimshaw, Alderman Toni Preckwinkle, Alderman Helen Shiller and Bernard Craighead. The event was sponsored by the University of Chicago Democratic Socialists of America Youth Section and the Hispanic Association for Cultural Expression and Recognition. Among the Chicago Democratic Socialists of America endorsed candidatesin the 1998 Chicago municipal elections were Helen Shiller and Barbara Holt. Honoring Committee members included Helen Shiller . In 2007, Helen Shiller was an honorary host for the 25th Anniversary of the Crossroads Fund. The fund, founded in 1981 supports community organizations working on "issues of social and economic justice" in the Chicago area.